I’m just amazed at how this blog has really taken off during the past 3 months. In that time the traffic has soared and in turn advertisers have begun to take notice, much to my chagrin. I got an email from one who wanted to buy some banner ads on my site. 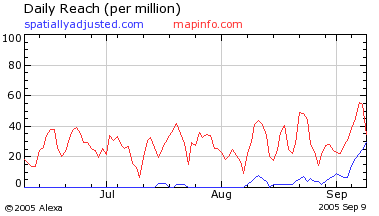 He sent me some graphs showing me how popular the site has become in relationship to existing GIS or mapping blogs. First of all, to compare this site to The Map Room is laughable. Anyone who pays any attention to the internet knows that Jonathan’s site is cited by more users than almost any other GIS or mapping website out there. Plus anyone looking at that graph the advertiser sent me can see that The Map Room has had high traffic levels for much longer than I have (6 months to a year). 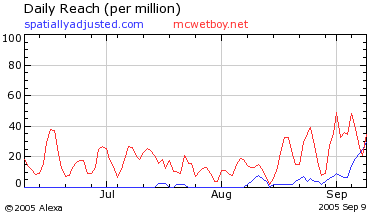 I think he added that graph in there to make me feel better about the site. AllPointsBlog is a little different, but I’d guess they are still much larger than this one. Something happened to the site when they changed their URL. Somehow it became less compelling than before, but maybe they are still trying to figure out what the blog should be. On top of that, changing their URL probably affected the results. This blog compared to Directions Magazine probably shows a more accurate picture of AllPointsBlog. The cost of this site to me is very low (I pay about $5 a month for hosting and my copy of Movable Type was paid for over a year ago). I don’t like ads on websites (I block most of them using FireFox anyway) so I’ll never have them here in any capacity. I also will always have full RSS feeds so you don’t have to even visit my site if you don’t want to. Also by the end of the week I’ll have an email subscription set up so you can follow the news via email if you don’t like RSS.